Reach out to our representative in your area to see if your desired time slot is available to hold your event. Leave it to us to find an adequate venue to hold your Bubble Madness event. Our team will manage and ensure the success of your event on site, so you can share in the fun! Improved visibility for the players. Better ventilation inside the bumper ball. Easier communication between players and facilitators. FOR AN EXCEPTIONAL GAME EXPERIENCE! Bubble soccer is very similar to classic soccer. However, how we play may surprise you! The objective remains to score as many goals as possible, but the players on each team face off in large transparent bubbles. Your feet remain free, allowing you to confront opponents and capture the ball. You’ll be able to safely shift your opponents over several meters! The King of the Ring game consists of eliminating all oppponents by forcing them out of the ring. There are no teams; everyone plays against one another. Players begin on the exterior line of a circle and the game starts with the blow of a whistle. When the referee eliminates a player, that player can no longer return to the game. The last player remaining is declared King! King of the Ring can only be played on a synthetic field. In Spartacus, two teams face each other and try to knock down all the opposing team’s players. Players are eliminated and must retire to one of the four corners of the field as soon as the side of their bumper ball touches the ground. The winning team’s points are awarded based on how many players on each team are still standing at the end of the round. Before the game, each team must choose a general. The generals will wear a bib and salute each other in the center of the field in order to properly identify themselves. When the whistle is blown, the teams face each other and attempt to knock down the opposing team’s general in order to win the match. All other players, except for the generals, can fall and get back up without being eliminated from the game. In Rooster Fight, all the players of a team are randomly assigned a number. The same set of numbers is then randomly assigned to players on the opposing team. Before the game, the referee will blindly draw one number. The two players who share this picked number must then take place at opposing ends of the field to face off and try to knock each other down. This game has the same objective as traditional ice hockey: the goal is to kick a giant puck into the opposing team’s net. However, players don’t wear skates.They slip and slide on an interior or exterior ice surface. Fun guaranteed! In Bubble Wars, two teams are each made up of five bumper balls and one Zorb (a giant bumper ball). The objective is to make your team’s Zorb reach the opposing end of the field before the opposing team’s Zorb reaches your end. The ten bumper balls on the field face one another while attempting to create safe passage for their Zorb, which allows for many different strategies and an epic clash of bumper balls that is sure to make you laugh! Archery Battle and Bubble Madness. Before the event, the person in charge must provide all participants with the necessary information regarding prohibited items (see Prohibited Items section below), dress code, and appropriate footwear. He or she must also send them the Important Pre-Game Instructions, as well as the Liability Waiver, Risk Assumption and Indemnity Agreement, so that all participants can review the information contained in these documents, print and sign the waiver. The person in charge of organizing the event must also advise all participants to arrive at least 30 minutes prior to the scheduled game time so they have sufficient time to dress, hand in their signed liability waiver, and warm-up properly in order to reduce the risk of injury. Facilitators will also check if all participants respect the dress code and are free of any forbidden objects at this time. Upon arrival, the person in charge must meet with one of our facilitators to pay the fees associated with the package, hand over all signed waivers, and ask any remaining questions. All participants must wear comfortable, appropriate sportswear (T-shirts, shorts, athletic pants, socks, etc.) as well as properly laced sneakers (no cleats). We also suggest you bring thin gloves (golfing or cycling gloves, for instance) to protect your fingers and knuckles, a towel, a water bottle, and volleyball kneepads. Glasses are forbidden on the field. Participants who require eyewear must wear contact lenses. Safety glasses with elastic bands are also forbidden. Cleats are forbidden in order to prevent injuries to other participants, damage to the bumper ball or to any other equipment. Winter boots (except during Bubble Hockey or other outdoor winter Bubble Madness games), sandals, or loosely laced shoes or sneakers are forbidden. All participants must wear properly laced shoes that provide adequate ankle and foot support. Players’ pockets must be empty at all times. Furthermore, no objects must litter the gym floor, the playing field or surrounding area in order to avoid injuries that could be caused by the intense contacts. Prior to the game, all players must store their personal objects (backpack, wallet, cell phone, sunglasses, shoes, etc.) in a safe space outside the play area (locker, car, etc.). Our facilitators are not responsible for the safeguarding of your personal belongings. We are not responsible for any theft that may occur during your event. The comment we hear most frequently from our first-time participants is that they feel invincible inside their bumper ball. However, no sport is completely without risk of injury. It is important to note that our players are well protected from head to knee inside the bumper ball; however, the lower extremities are more exposed to the risk of injury. If you are injury-prone in this zone, then a sprain or pulled muscle could occur whether or not there is contact with another bumper ball because you will be running, jumping, rolling, etc. These types of injuries may also occur from improper use of our equipment, which is why our facilitators insist on the safety rules with players when providing them with initial training before the game. They will ensure a rigorous application of these rules at all times so that all our participants can benefit from a pleasant and safe environment. to kick another player or any Bubble Madness (TM) equipment, or you risk being expelled without reimbursement. to intentionally aim for another player’s legs with your bumper ball, so as to avoid lower-body injuries. to project another bumper ball in the direction of the walls or corners of the gym, in order to avoid injuries to the legs. to pick on a participant who doesn’t have the ball, or a participant who is already down and trying to get back up. It is very important to control the intensity of your tackles when you surprise a player who is not expecting to get hit. to push a goal-keeper or any other player in toward the goal’s nets. The goal-keeper must play only within his defensive zone. to keep playing or tackling other players once the game has been ended by our facilitators, or you risk being expelled. Our facilitators will not ignore any situation that could be deemed dangerous or compromises their safety, or the safety of the players and spectators in any way. You are responsible for your actions and any consequences resulting from poor behaviour on your part, for risk of being expelled. There will be no reimbursement. Play cautiously and responsibly! A mandatory information session will be led by our facilitators prior to the start of the first game in order to explain the rules of the game and to ensure the safety of all the players and spectators. This training session is mandatory for all the players present during your event. Furthermore, prior to your activity, it is very important to read the Liability Waiver, Risk Assumption and Indemnity Agreement documents in order to review the responsibilities of each party with regard to any incidents or accidents that may occur during play. The person in charge of your event must have all the signed waivers prior to the start of the first game, so they can be submitted to our facilitators. Bubble Madness is a physically demanding sport so a period of play will last no longer than 10 minutes. The breaks between the activities are included in the total duration of the event. The duration of the breaks will vary depending on the games chosen. You will be able to discuss this at the time of your reservation or with our facilitators upon arrival. We recommend a size corresponding to at least three badminton courts to maximize the playing space. In an interior gym, there is no out of bounds; the ball is constantly in play because it bounces off the gym walls. No spectators are allowed in an interior gym in order to avoid injuries caused by contact with a bumper ball or a game ball. The game will be stopped if our facilitators notice spectators infringing this rule. On an outdoor soccer field, the boundaries are marked by the exterior lines of the playing field. The dimensions of the field can be reduced to accommodate fewer players and the type of game chosen. When the ball goes out of bounds, the team that did not touch the ball last will take possession. That team will choose one player to stand along the exterior line with the ball. The opponents will stand back a minimum of 3 meters to allow the player to kick the ball. When the referee blows the whistle, the player along the line will kick the ball and play can resume. No spectators are allowed on the playing field in order to avoid any risk of injury resulting from contact with the bumper balls or the game ball. In Bubble Madness you can send your opponents rolling over a distance of several meters without danger. One of our priorities is the safety of all players and staff. All our facilitators are provided with the necessary training which allows them to coach each player before, during, and after the game. An information session on risk and injury prevention will be given to all participants prior to the game to ensure the safety of all those present and to avoid the risk of injury. We invite you to consult the Important Information section for more details on prohibited items, rules and advice on injury prevention. It is important that each player completes the form below and hands it over to the person in charge of the event before the start of the game. The different price classes are related to the age and use of the bumper ball, which has an impact on its opacity. A first-class bumper ball has less than six months of use and is considered new. A second-class bumper ball can have between six and twelve months of use and we estimate that visibility inside the bumper ball can be reduced up to 50%. We assure you that you will have as much safe and secure fun with either of the options chosen. Setup and facilitation, preventive training on the risk of injury and rules to be respected, liability and material damage insurance, travel expenses within 25 km of Quebec city, a cancellation policy, the bumper balls, soccer balls, cones and towels. What is the maximum size an adult bumper ball can accommodate? A 45-inch waist line, measured at the belly button. Does it get hot in the bumper ball? Yes, because your body will release a lot of heat because of the physical effort made. Bring a towel and a water bottle. Is there a risk of suffering a sprained ankle or injury to the legs? No more than in traditional soccer. 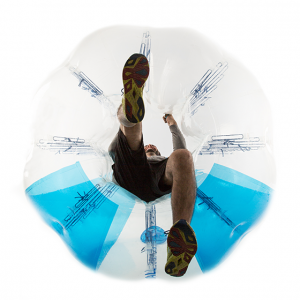 Since the bumper ball has a diameter of 1.8 meters it will absorb the impact of your legs on the ground in case of a fall. Your knees will not suffer any discomfort apart from when getting up , because they are inside the bumper ball. We do strongly suggest that you wear volleyball-type kneepads. Furthermore, in order to reduce the risk of injury to the legs, it is forbidden to shove another bumper ball in the direction of the gym walls. Is it hard on your neck and back? No, because your back and neck are well supported against the interior wall of the bumper ball. Simply strap in properly using the two safety belts and maintain fair pressure with your hands against the two handles on the interior of the bumper ball. Is it hard to hit the ball from within the bumper ball? Turning to the right or the left is a bit of a challenge because you are supporting an extra 23 pounds. However, the ball is a fluorescent colour, so that you can easily follow it in play. Should I tie my hair up if I have long hair? Yes, if you are upside down and you are wearing a pony tail your hair could get caught between your bumper ball and the ground. It is recommended to wear a bun. Is it complicated to get in and out of the bumper ball? No, you will quickly grasp the technique once the referee explains it to you. How much does the bumper ball weigh? An adults’ bumper ball weighs 23 lbs (10 kg) and a children’s bumper ball weighs 18 lbs (8 kg). What are the dimensions of the adults’ and children’s bumper balls? An adults’ bumper ball is 1.3 m high and 1.8 m wide. A children’s bumper ball is 1.15 m high and 1.5 m wide. Will my bumper ball be clean before play? Yes, 100% clean. All our bumper balls are cleaned with an eco-friendly and non-toxic disinfectant after every use. Proper hygiene is one of our priorities. Is possible to get up alone or is help necessary? You can get back up on your own without any difficulties. You simply have to roll onto your belly and get up using your knees. If you do struggle, our facilitators will quickly assist you. Should we bring coloured bibs or shirts of different colours? No, each one of your team’s bumper balls will be identified by a colour. Can I be heard by the other players when I am inside the bumper ball? Yes, there is a large opening above your head and in front of your face. Are there water and bathroom breaks? Yes, a three-minute break is granted between each period. Does each player keep the same bumper ball throughout the event? Each player will keep the same bumper ball unless involuntary damage is caused to it; in that case, a second bumper ball will be provided. If I have to leave mid-game, what will the other participants do? If you have no reserve players, they will have to play four against four. Fun is always 100% guaranteed. How many players do you need to play? A minimum of 8 players is required to play, i.e. four against four. How long does a game of Bubble Madness last? Everythings depends on the package you choose. Usually, a one-hour rate includes three periods of play averaging ten minutes each. There is a short five-minute break between each period. If after three periods of play, there is still ample time, then a fourth period will be played. After the first period, you can replace a period of Bubble Soccer by another game like General Tao, Spartacus, King of the Ring, or Rooster Fight. You must advise our facilitators upon your arrival if you wish to do so. Are the teams made up of men only and women only, or are theymixed? It’s up to you. Everyone can play together! Do I have to bring any special equipment to play? No, comfortable sportswear and properly laced sneakers (no cleats) suffice. Your pockets must be empty at all times to prevent any risk of injury and no personal belongings are allowed on the playing field. Please plan for a safe space for your personal belongings. Please consult the Dress Code and Recommended Equipment sections, as well as the Prohibited Items section, to review specific points, such as the fact that it is forbidden to wear glasses or cleats. Is there a minimum or maximum height to play? No, However, it is recommended that very tall people wear volleyball-like kneepads because our bumper ball is 1.3 m high. This will help absorb the impact on your knees when getting up after a fall. Is Bubble Madness safe to play? Yes, because the bumper ball protects you from head to knee. Two safety straps help keep you secure inside the bumper ball and two interior handles help you maintain your position within the bumper ball. We strongly suggest you wear volleyball-like kneepads because you will have to get up from your knees after a fall. Moreover, our facilitators will provide you with adequate information to minimize the risk of injury. Is there an age minimum to play? Yes, the age minimum is five years old with signed consent from a parent or legal guardian.